All gasoline vehicles between the ages of two to 24 years old registered in Fort Bend, Harris, Brazoria, Montgomery and Galveston Counties are required to undergo an emissions test as part of the annual Texas State Vehicle Inspection program. Ninety days prior to the expiration of your vehicle’s registration sticker, you will be mailed a notice by the state. You will undertake the safety inspection process as usual, except there will no longer be an inspection sticker given to you once it’s been completed. Inspection results will be stored in a Texas DPS database, and you, as the vehicle owner, will also receive a printout of your test results. Registration renewals may then be done after the results have been stored, either by mail, online, or in person. A single sticker will then be issued for the windshield representing both the safety inspection as well as the registration. The cost of a state inspection is $25.50 for vehicles that are 1996 and newer. Vehicles that are 1995 and older are $31.50, however; if the vehicle is 25 years or older, the fee is $7.00 for a safety only inspection. Diesel vehicles and motorcycles are $7.00 as well. Inspection hours are from 7am – 6pm, Monday through Friday. Most inspections take about 30 minutes to complete. We offer 2 inspection bays and 3 full-time inspectors to minimize your wait time. If your vehicle fails the inspection, you have 15 days to fix the problems and get your vehicle inspected again. This incurs no additional fee. If your check engine light, “service engine soon” light, or malfunction indicator lamp is on, your vehicle will immediately fail the inspection. However, we can take care of any and all repairs necessary to ensure your vehicle passes inspection, including emissions testing. We are a Texas Recognized Emissions Repair Facility. 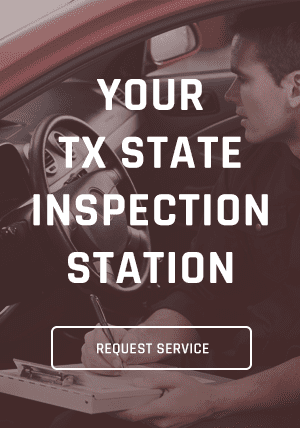 For additional information on the Texas State Vehicle Inspection program or to make an appointment, contact us today.